Ace/ROC editor Anne Sowards is doing her Spring Preview and Giveaway on Dear Author, talking about upcoming books, and giving away a number of advanced copies. Operation Auction, set up in support of a member of the romance community, is underway. Lots of goodies still up for grabs, so check it out. I'm very happy to share that Bonds of Justice won the award for Favorite Paranormal Romance, and Archangel's Kiss for the Favorite SF, Futuristic or Urban Fantasy Romance. The Psy/Changeling series won the award for the Favorite Continuing Romance Series! Photos to come when I've had a chance to download them. Today, I have the Kiss of Snow excerpt I promised as part of my DABWAHA campaign. Archangel's Kiss is now one of the final four books remaining. Thanks for the support everyone and I hope you're having fun playing! What is wrong with you?! she telepathed. I cannot be in a car alone with him. Especially when those ice-blue eyes had gone slightly aglow. Deal with it. It was a pitiless response. If you need that to be an order from a lieutenant, then consider it done. She was ensconced in the passenger seat, her wireless speaker buds in her ears, by the time Hawke finished talking with Judd and got into the driver’s seat. He didn’t say anything until he’d turned the SUV around and they were on their way. Then he leaned over and pulled out the bud on his side. Time to talk books. What are you reading and loving this week? p.s. I'm off to the Australian Romance Readers Convention, and so looking forward to it! See some of you there! p.p.s. Don't forget to vote for Archangel's Kiss in the DABWAHA! The third round of voting is currently underway. 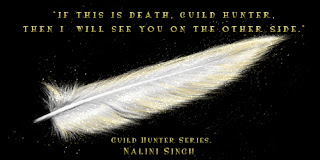 I'm very excited to share that I'll be writing four more Guild Hunter books. No release dates yet, but I thought you'd all like to know that there will be at least four more books set in the Guild Hunter world. I hope you're all having a great start to the week. I've had a little bit of a break after turning in Archangel's Blade, but I'm back at work now on the next Psy/Changeling book. More info to come later. The DABWAHA Second Chance Tourney is open if your original bracket didn't survive rounds one and two. Round three will start soon, and Archangel's Kiss is up again, so keep an eye out. Lord of the Abyss, Art, Stories & More! This might be a long post - I have so much interesting news to share! First, my gorgeous cover for Lord of the Abyss! You can read the backcover blurb on the website. Talking about lickable abs (or was that just me *g*), I'll be posting the cover for Archangel's Blade soon, so keep an eye out! The voting in the DABWAHA has begun! Make sure you vote for your favorites. *coughArchangel'sKisscough* New polls go up every 12 hours. The website has just had a major update, including with a new short story, and the first set of wallpapers, banners and icons for you to use. If you go to the home page, and look on the right hand side, you'll see the total list of updates. Here's the banner - isn't it gorgeous? Archangel's Kiss has been nominated in the DABWAHA - make sure you all fill in your brackets. The prizes are awesome. 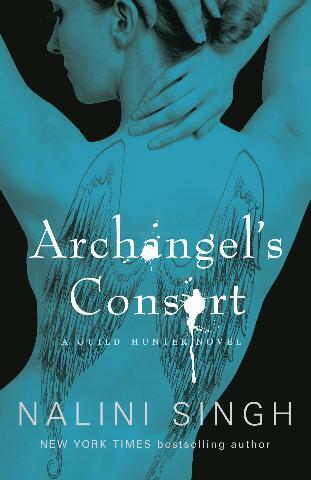 And when the voting rounds begin, why, I might be giving away some prizes if Archangel's Kiss wins. ;-) Everything's fair in the DABWAHA - speaking of which, check out my Oddshots post. Thank you to everyone who entered the contest! I hope you all enjoy Kiss of Snow when it releases! I was able to give away more than 5 ARCs - here are the winners. Congratulations! All the winners have been emailed. Also, the website will be updated soon. There shall be a nice surprise. I'll let you know once the updates are complete. I hope you're all having a great week. What are you up to? I've turned in Archangel's Blade! I loved seeing beneath the surface of Dmitri, dark, dangerous creature that he is, and learning about the (fascinating) woman strong enough to take him on. I can't wait to share their story with you all! For now, here's the backcover blurb! Excerpt to come a little later. It's time to talk books! I want to mention Julie James' A Lot Like Love, which has just been released. I was lucky enough to read it early, and absolutely loved it! Julie writes the most wonderful characters. If you like contemporary romance, definitely check this one out. Here's the blurb. You can read an excerpt on Julie's website. As the top undercover agent in Chicago, Nick McCall has one rule: never get personal. This “date” with Jordan Rhodes is merely an assignment—one they’re both determined to pull off even if they can’t be together for five minutes before the sarcasm and sparks begin to fly. But when Nick’s investigation is compromised, he and Jordan have no choice but to pretend they’re a couple, and what starts out as a simple assignment begins to feel a lot like something more. . Okay, your turn! What are you reading and loving this week? If you'd like to go in the random draw to win one of five Advanced Reading/Review Copies of Kiss of Snow, send an e-mail to naliniDOTassistantATgmailDOTcom with "Kiss of Snow ARC Contest" in the subject line by by 7pm Thursday March 10th, 2011, New Zealand time. Edited to add: Please follow the correct format for entry re the subject line, so your e-mail goes into the right in-box. Thanks! Since these are Advanced Reading/Review Copies, if you win, I'd ask that you please post a review somewhere, on or before the release date (May 31st, 2011) - on a blog, on Amazon, B&N, Goodreads...it's up to you, but it would be much appreciated if you'd post your thoughts somewhere. The contents of the review are, of course, totally up to you, but I would request that you not share any major spoilers until after the book is out. I'll give each winner 48 hours to respond to the email indicating they've won. If I don't hear back within that time, I'll redraw. By entering, you give me permission to post your name on the blog should you win. The fine print: Contest is open internationally. One entry per household. No purchase necessary to enter. Winner will be chosen randomly using random.org and his or her name(s) posted on this blog on Saturday, March 12th, 2011. Void where prohibited.